A four-year-old girl who has refused to eat anything other than Petits Filous yoghurt for her entire life has baffled doctors. Little Emilie-Lea Hayward munches through an incredible 30 pots every day and will only eat the raspberry and strawberry flavour. She refuses to eat any solid food and becomes hysterical every time mum Naomi, 32, offers her anything other than yogurt. The youngster won’t touch chocolate, sweets or ice cream and even bursts into tears if she is offered an alternative brand of yoghurt. 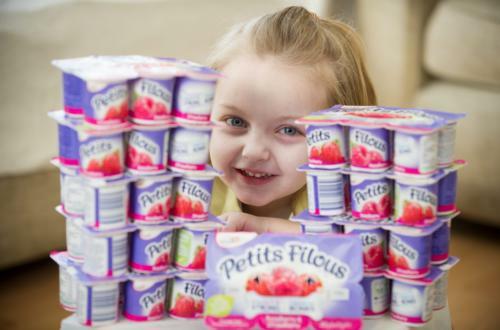 Each 47g pot of Petits Filous contains around a teaspoon of sugar, meaning Emilie-Lea is consuming 30 teaspoons a day – more than twice the recommended adult intake. But doctors who have examined the youngster say her unusual diet – which costs more than #2,000 a year – is not affecting her health or development. However, full-time mum Naomi is worried about the long-term implications and is desperately trying to find somebody to give her some answers. The mother-of-three, from Beaconsfield, Bucks., said: “She has seen pediatricians and dietitians but nobody has been able to help her and I don’t know what to do. “She will play with other food and touch it with her hands but she becomes hysterical if you try and feed her it. “It is just totally bizarre. I breast fed her and then gave her formula and then she had yogurt but she would never take that next step. “As she was growing up my family kept saying she would grow out of it but she has started pre-school and I am really worried. 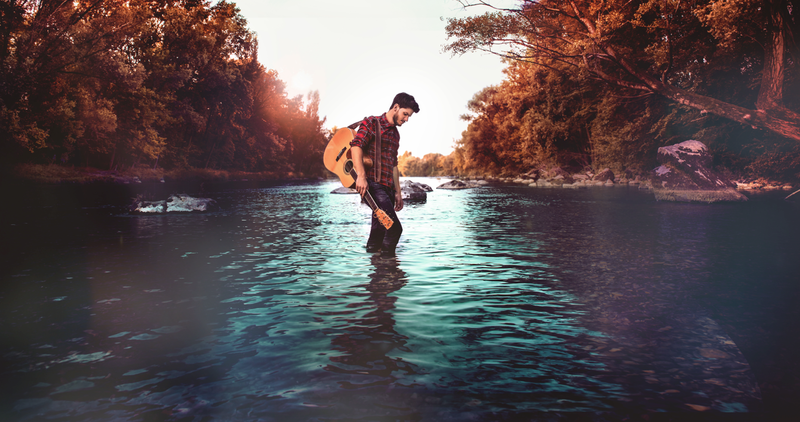 “I have tried to get her to eat in a telling way, I’ve tried in a nice way, I’ve tried using encouragement, I’ve tried using other children, but nothing works. “She just gets hysterical if you put something on a spoon and give it to her. I can’t force feed her and I’m starting to think she will never grow out of it. “It really has started to worry me. She is going to be starting school in September and she needs a variation in her diet. “We thought the pediatrician would be able to help but she hasn’t had a case like it before. 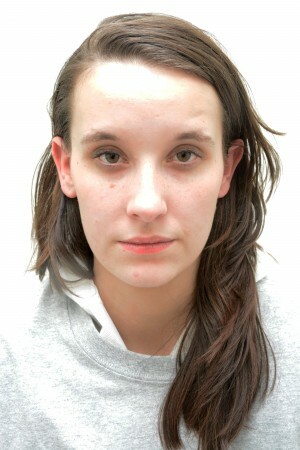 Naomi has to make daily visits to her local supermarket to cope with Emilie-Lea’s diet – which tops 11,000 pots a year. She will eat six pots for breakfast and then snack on another two dozen pots throughout the rest of the day. Naomi said her daughter even turns her nose up if she tries to disguise one by putting it in an empty Petits Filous pot. Siblings Daisy-Grace, two, and nine-month-old Harper-Jane eat normally. Despite her diet Naomi says doctors at High Wycombe Hospital have told her the youngster is just as healthy as any other child her age. Naomi added: “She is a very happy child and totally normal in every way apart from this. “It hasn’t affected her health in any way. We have had blood tests done but she is not anaemic or anything and it is all normal. A recent report by the World Health Organisation recommended that adults should eat no more than 12 teaspoons of sugar a day. British Dietetic Association spokeswoman Nicole Rothband said Emilie-Lea could be at risk of becoming “dangerously anaemic”. She said: “We do come across children who miss that really important weaning window but this is a very unusual case. “She will probably get enough protein and energy from the diet and she will certainly get enough calcium. The issue would be for minerals and vitamin deficiencies. “There is no iron in that diet whatsoever and we find children who rely exclusively on milk become dangerously anaemic. A spokeswoman for High Wycombe Hospital said it does not comment on individual cases.